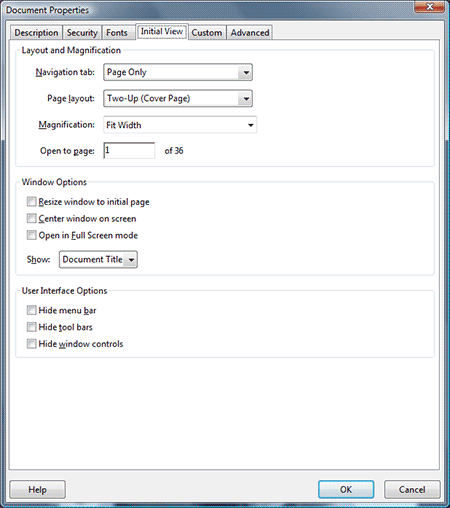 Have you ever wondered how to make your PDF files open in a particular page display layout? Sent a PDF of a booklet or magazine to someone and wondered how to make the title appear on its own page? The “Initial View” setting in Adobe Acrobat is the answer. Simply open Document Properties (Ctrl+D on Windows, or âŒ˜+D in OS X) and click onto the “Initial View” tab. Here, you can set the initial page display format, opening page, zoom levels, and even what the title of the window is. When you’re done, just close the Document Properties window and save your file. Easy!